Despite the fact that Cuba is officially an atheist country, and proselytizing is illegal, it is estimated that over half of the population are believers of some sort. Christianity has never had a strong influence in Cuba partly due to history: the Church had sided with the Spanish during the war for independence, causing the government and the church to officially separate with the birth of the Republic in 1902. Thanks to a visit from John Paul II in 1998, a re-institution of Christmas as a holiday, and on-again-off-again dialogues between the government and Catholic and Protestant groups, Christian observance has enjoyed a renaissance, at least in terms of public observance. Afro-Cuban religions and saint worship, of which santeria or Regla de Ocha is the most well-known, have been deeply entrenched in Cuban culture for three centuries. Santeria is a classic religious syncretism in which aspects of Catholicism (saints) have been fused with aspects of the Lucumi religion of the African Yoruba tribes (orishas). More a way of life than a faith, santeria expounds that orishas control an individual's life. Male priests, called santeros or babalaos, act as go-betweens to honor and interpret the orishas. Unlike Catholicism, there is no talk of sin or final judgment. 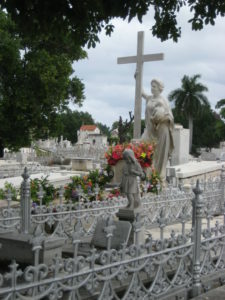 Many Cuban homes have small shrines dedicated to particular orishas, and it is not unusual to see an all white-clad initiate, or iyawo, on the street. Cuba's Jewish community once thrived on the island, with Havana's population supporting five synagogues, several schools and a college. Today practicing Jews number about 1,300 or 5% of their pre-revolutionary population. It is thought that Sephardic Jews first came to Cuba from the Mediterranean countries, and established businesses in Old Havana, contributing to the economy. Compared to other countries, Cuba has been free of anti-Semitism. Jewish religious schools were the only parochial schools allowed to remain open after the Revolution, and the Cuban government has always made matzoh and kosher meat available for observant Jews. Today there is a renaissance in the Jewish faith on the island, with synagogues being refurbished and established community centers becoming active. For historians, religious academics, and interested individuals, Cuba Cultural Travel can arrange a tour of appropriate religious sites, churches, synagogues, museums and community centers.